So much has happened of late that it is hard to go back far enough to recount it. As William Butler Yeats said so well, "The grass cannot but keep the form, where the mountain hair as lain." So true, but I will try to catch up here. First, a few words about where my mind is right this moment in the wee hours of morning, and then something about what's happening around here. Here is what I am thinking about trying to fill you in, so at least this part is fresh. I find that reinventing yourself never works. It is already too late. Better to sample from the present moment, however dull, than it is to attempt to reanimate a more colorful past. This whole idea of reanimation is such a ghoulish affair. And the past is such a murky area to poke around in. Where is the percentage? If the moment is not present, it is not a present moment, obviously. Dwelling on the past is only an attempt to dwell in the past. It can't be done. We can only live now and even that is questionable. This is why historians are so nostalgic. It goes with the trade. If we hang back, life drags us along, which psychologists label as masochistic. They are correct in that. The same is true for the future. We can't live there, yet. We can strain in the present to force the future, but we can only lean forward so far. Psychologists label this as sadistic. When our strength fails, and it will, we fall back into the present, where we hopefully find ourselves. But even the present has its problems, because we endlessly hover or fluctuate between past and future thoughts. Even the present is barely there at all, so the so-called present moment is no final resting place – no peace. This whole "time" thing is problematical, not only theoretically, but also if you drill right down and carefully examine this present moment. When I can manage it, I find the present moment a good place to rest in and abandon thought entirely, to just let go. Even letting go requires a technique. Perhaps this is why great Buddhist meditators allow the mind to just rest as it is, and while resting look through the present moment (like a window) into the nature of the mind itself rather than get caught up with what they call the three times, past, present, and future. Enough rambling. Here is what I have been up to since Monday. Monday night it was a quick drive into Grand Rapids to the Gerald Ford International Airport to pick up our dear friend Lama Karma, who is here for a few days to record some Tibetan Buddhist sadhanas in our studio – chants, prayers, and so on. The plane was a little late and afterward we went to Bombay Cuisine for some Indian food, the milder the better for me. I am not a spice person. That was years ago, and today Lama Karma travels all over the world teaching dharma. He has personally done two traditional closed 3-year retreats, where he was fully trained in meditation and in the mind itself. Each retreat is three years, three months, and three days in duration. During such a retreat, the retreatant never even lies down to sleep, but sleeps sitting up in meditation posture. 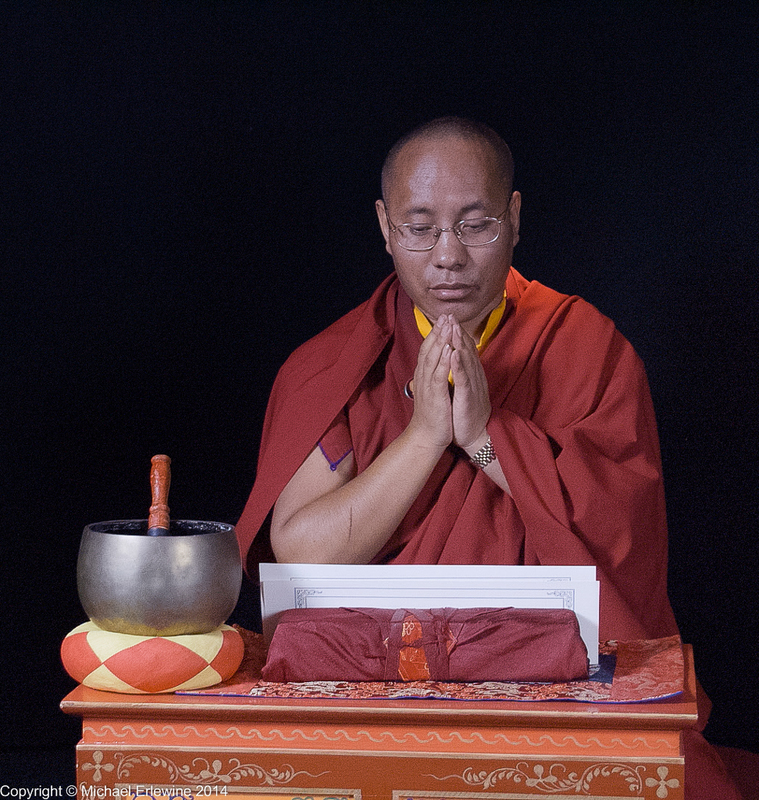 Lama Karma has done two consecutive back-to-back retreats, over six-and-one-years. Lama Karma is like a member of my family, like a son. My kids love him and vice versa. We have fun. As mentioned, yesterday we worked in the studio, made food, and we all enjoyed my granddaughter Emma, who insists on calling Lama Karma "Rinpoche," probably because the only other person she has seen in robes is our teacher Khenpo Karthar Rinpoche. Yesterday afternoon, Lama Karma helped us build a small Mahakala shrine in our shrine room. We will be doing some more recording today and then we are off on a little trip to Michigan's Upper Peninsula.